Hard Times: The Resurrection of Angel Camacho Jr.
A junior is following in his father’s fighting footsteps and he’s taking strides beyond those made by Angel Camacho Sr., a tenacious power punching former Golden Glover from Puerto Rico. And although he’s not related in any form or fashion to the late Hall of Famer Hector “Macho” Camacho, you probably should have heard about the 35-year-old Angel Camacho Jr. by now. The Providence, Rhode Island born light heavyweight (16-0, with 5 KOs) is currently on the third of three comeback trails from three lengthy periods of career inactivity totaling over nine years. He knows it’s now or never. “I still have to grind,” he says. If things had gone according to plan, Camacho Jr. may have by now added a victory over Peter Manfredo Jr. to his resume. Instead, the talented boxer lost his biggest opportunity to a foot injury suffered while running on an outdoor trail just two weeks before the biggest fight of his life. Making his pro debut in 2006 at age 23 after a brief 1996 stint in the amateurs where he competed in only fifteen bouts, Camacho racked up eleven wins in two years on the New England circuit before a domestic assault situation landed him in jail; derailing his true passion. He ultimately served nine months. When Camacho came back in 2011, he was matched against local gatekeeper Keith Kozlin on a Big Six Entertainment card in West Warwick. It was obvious to everyone who saw him that the quick-fisted Camacho could still move his hands. Using his height and reach advantages, the six foot tall Puerto Rican American busted up Kozlin’s right eye and scored a unanimous four round decision while wearing an RI-DOC issued ankle bracelet as a condition of his parole. When he came back again in 2014, Camacho, signed and promoted by Jimmy Burchfield’s Classic Entertainment & Sports, faced another stiff test in Paul Gonsalves. Camacho notched a unanimous six round decision win at CES’s homebase of Twin River Casino in Lincoln, R.I. Things were looking up in 2015 for the local standout and he was starting to show up on my radar as a New England fight writer. Five months after the Gonsalves win, Camacho was back in a CES ring, stepping up against tough super-middleweight southpaw trial horse Chris Chatman. Camacho scored another unanimous six round win but it was quite a struggle. 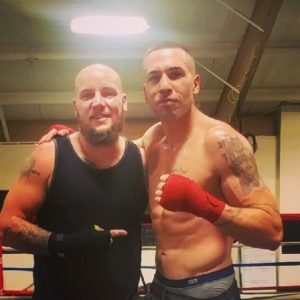 Five months later in September at Twin River, Camacho faced his sternest test yet, a ten round scheduled matchup against Rich Gingras for a vacant UBF 175 pound title belt. In a high contact local throwdown, Camacho stopped Gingras in the eighth round to grab the biggest victory of his on-again, off-again career. The fight was an absolute war of attrition won big by Camacho after uncorking a highlight reel worthy nine-punch combination to end it. The brutal loss effectively ended the boxing career of Gingras who came back unsuccessfully three years later in 2018. Using social media, Camacho reached out to me after the Gingras TKO wondering why I hadn’t yet written a story about him. He encouraged me to do so and I set out to pay extra close attention to his development. I could see he was clearly a cut above the locals he was being matched with and that good things were in his future. Instead, Camacho dropped off a cliff. He didn’t stop training but Camacho did stop fighting. It’s a shame too because even though the title belt he won in the Gingras fight is a minor one, Camacho was enthusiastic and excited about defending it. In May of 2016, he was scheduled to put it up for grabs in an all-Providence vs. Providence battle with former Contender star Peter Manfredo Jr. in a huge CES main event. This high profile encounter with Manfredo was supposed to be the fight that propelled Camacho beyond New England, to the next level, to the bigger and better things that boxing offers winners. Camacho pulled out with a foot injury. Manfredo fought replacement opponent Vladine Biosse instead. The ‘Pride of Providence’ was held to an eight round split draw and has not fought again since. From ringside, Camacho could see the decline of the ring rusted Manfredo as clearly as anyone else around him. Had they fought as scheduled, it’s likely that the slick and aggressive Camacho would have upset Manfredo, kept his title and maybe even earned another one as the new Pride of Providence. Slated to return just a few months later on July 15, 2016 in defense of his beloved UBF title against “Vermont Bully” Kevin Cobbs, Camacho saw another CES main event opportunity slip through his fingers when a devastating shoulder injury occurred in training. Camacho was in the gym throwing his right hand at the heavy bag when he felt a terrible shoulder pain. He’d injured his rotator cuff and he now needed surgery to repair it. The recovery was long and grueling. It looked like Camacho was no mas. Frustrated with boxing’s ups and downs, Camacho started working manual labor jobs to support his family. Days turned into weeks and into months and then into years. I never got to write that story about the up-and-coming Angel Camacho Jr. because there was no longer one to tell. Camacho (who insists he’s really a hungry super middleweight) got himself back into the ring and had his hand raised for the sixteenth time as a professional on March 15, 2019. He describes himself as still being in his “peak” physical prime. “I’m probably in the best shape of my life,” he says after officially weighing-in at 171 lbs. He doesn’t want to live with the regret of never knowing what he could have accomplished in the sport he loves and thinks of like chess. Last Friday night in Massachusetts, the comebacking Camacho appeared on the undercard of rookie promoter Chuck Shearn’s debut Worcester Palladium fight card entitled Every Man For Himself—a local club show full of pawns making their opening moves in the boxing game. Camacho had to work to defeat his 40 year-old opponent Larry Smith, a 10-40-1 Texas fall guy who always shows up and tries to win even if he rarely does. Camacho showed no sign of his two previous injuries (he led with his left foot and threw strong right hands at Smith) but he complained of a new issue after the fight in the dressing room, revealing an unknown chest injury suffered in sparring with previous opponent and now good friend Keith Kozlin. Camacho did show some signs of ring rust after his long layoff but he stayed busy to the body and was rewarded with a clear unanimous decision. There was also an angry little nick under his right eye from being thumbed by Smith. The judge’s scores were 60-54 and 59-55 twice. “This is the first step in my comeback,” says Camacho. Speaking of which, he almost tripped on the metal ring steps on his way into the ring and in the third, with Smith leaning on him, he nearly fell out of the ring and onto the photographers on the ring apron. Trying to hurt him but not get him hurt, Smith held onto Camacho and prevented him from falling clear out the ring. “I love you Larry,” Angel said before the men parted ways. 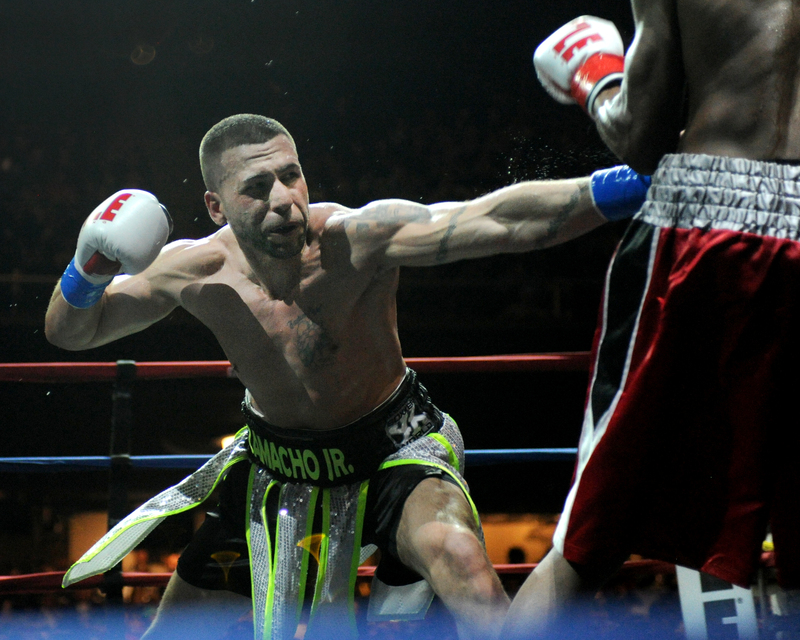 According to his management team, Camacho is now looking at a return to Twin River casino on April 26 and then a possible June appearance against local upstart Richie “Popeye The Sailor Man” Rivera, an undefeated 10-0 (9) light heavyweight puncher from Hartford, Connecticut. The next time I saw Angel Camacho, it was Saturday April 6, three weeks after the comeback win in Worcester. He was in West Warwick, Rhode Island kneeling over the open casket of his former opponent and good friend Keith Kozlin, a former prizefighter, movie actor and all-around good guy. Camacho was as distraught as any one of the hundreds of people who came to show their final respects to Kozlin, a husband and father of three girls including twins. Rest in Peace Keith Kozlin. Go to work Angel Camacho. Boxing writer Jeffrey Freeman grew up in the City of Champions, Brockton, Massachusetts from 1973 to 1987, during the marvelous career of Marvin Hagler. He then lived in Lowell, Mass during the best years of Micky Ward’s illustrious career. A new member of the Boxing Writers Association of America, Freeman covers boxing for The Sweet Science in New England.